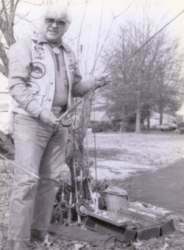 Mr. Clyde A. Harbin Sr. is famously known World Wide as The BASSMAN. He is registered at the United States Patent and Trademark Office as the "THE BASSMAN™". 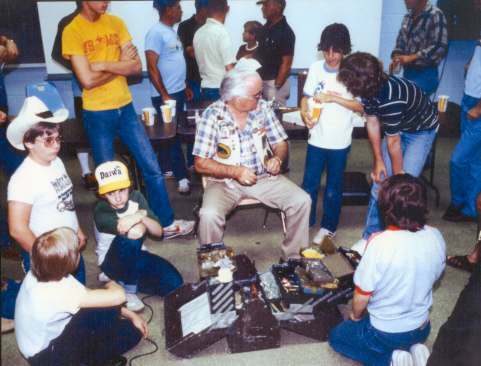 Mr. Harbin is the nation's authority on antique fishing lures and is the most well known Heddon lure collector in the world. 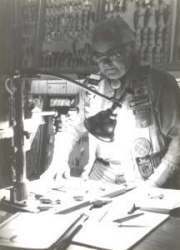 Mr. Clyde A. Harbin has done over thirty years of research on the Heddon family and the Heddon company. 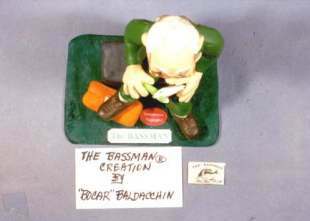 The Bassman Creation is a handmade sculpture made by Mr. Carmen Baldacchin of Toronto, Ontario Canada. 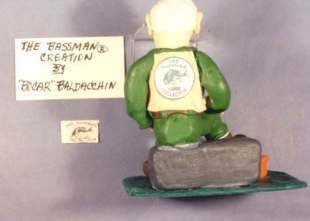 Mr. Baldacchin presented Mr. Harbin with his sculpture as a gift for his 85th Birthday on January 15, 2001. Mr. Harbin named this beautifully crafted sculpture of himself The Little Bassman. Mr. Baldacchin met Mr. Harbin through e-mail contact this past November of 2000. Mr. Harbin is helping Carmen with inquiries about old lures and other related fishing questions. 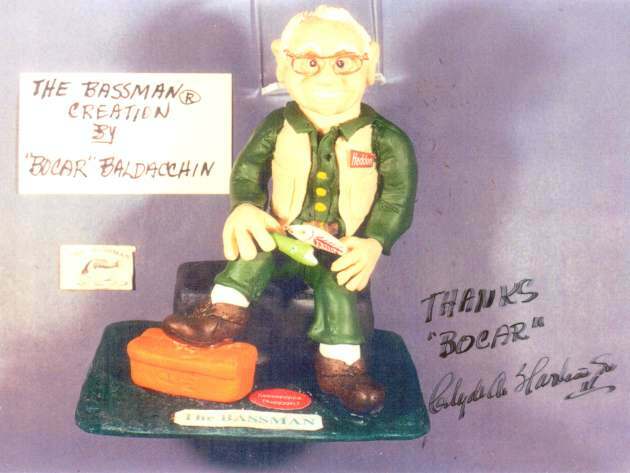 Mr. Harbin shortly gave Mr. Baldacchin a new nickname of "Bocar" which Carmen accepted and started signing "Bocar" on his artwork as his signature. The Little Bassman is his first piece of artwork to have been signed "Bocar". The bulk of the material used for this sculpture is a molding clay called Fimo. After the Fimo clay is sculpted it is then baked in different stages in a oven. Later the sculpture can be incorporated with other materials such as wood, wire and foil depending on the item. Fimo comes in many brilliant colors and depending on the artwork painting may not be necessary. After all this Mr. Baldacchin then puts on the finishing touches by painting the eyes, eyebrows and lips, etc. on his artwork. Mr. Baldacchin is a naturally gifted and talented artistic. He is self taught in all facets of art and enjoys doing artwork as a hobby. Carmen mostly does his artwork for friends and family. Recently he has been doing sculptures on fishermen characters with their catches with fishing rods and lures. Mr. Baldacchim made this piece of artwork because of his recent friendship he shares with Mr. Harbin. To quote Carmen's wife she said Mr. Clyde Harbin is a "Fine Southern Gentleman".